Dr Elise Lenske had the desire to become a veterinarian for as long as she can remember. She was lucky enough to grow up on the Sunshine Coast surrounded by a multitude of both small and large animals and was actively competing in a number of equine disciplines when working with horses. Elise had to take a break when she moved to Brisbane to complete her degree, however, she worked as a nurse in a local vet practice which kept her surrounded by animals. Elise graduated from the University of Queensland with first class honors in 2010 and relocated to Dubbo NSW to work in a busy rural mixed practice. Here she was able to experience a huge variety of different cases – both small and large animals. 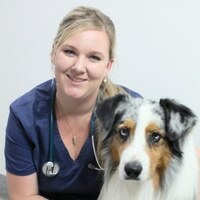 In 2013, in order to pursue her interest in small animal surgery and emergency care, Dr Lenske moved back to Queensland and commenced working with the Animal Emergency Service where she is now a Senior Veterinarian. After further study, she obtained membership of the Australian and New Zealand College of Veterinary Scientists in Emergency and Critical Care in 2016. The following year Elise commenced working in the Pet Intensive Care Unit which is dedicated to providing 24-hour critical care for pets. Elise is committed to ongoing education, research and development to ensure that every patient can receive the very best care; she is very fortunate to be surrounded by a team who support and share this passion. Outside of work Dr Lenske enjoys training and competing in agility with my Australian Shepherd, Hudson. She loves spending time outdoors, hiking, traveling and developing her photography skills. She also has a passion for snow and in the colder months head to the mountains with my snowboard whenever possible.